Offerings start at 10 cubic yards and up to 30 cubic yards in Kissimmee, FL. We deliver containers 5 days a week so quick turnarounds are easy. The price you are quoted is the price you will pay. We do not tack on extra fees like delivery and hauling. Rental period is flexible and we offer swaps/ dump and return service upon request. Always on call for pickup and delivery requests. Knowledgeable staff to help you find the right roll off container for every project. Work to find the best price for each and every customer. Rental extensions available on every dumpster order. When getting ready for a delivery and pickup be sure to keep the space available for the driver. For delivery it is best to designate a delivery area. Decide where you would like the dumpster placed onsite. The truck needs about 40-50 feet to delivery the container because the box has to roll off the back of the truck. That means it is best to keep cars away from the drop location. Be sure that no gates are locked, no wires hanging, and nothing else in the way to avoid any trip fees associated with your rental. We usually schedule the final pickup date for you so be sure to be ready for the final pickup. What Kind of Roll Off Container Do I Need? We offer a variety of dumpster rental sizes so that each project is specified and equipped with a roll off. 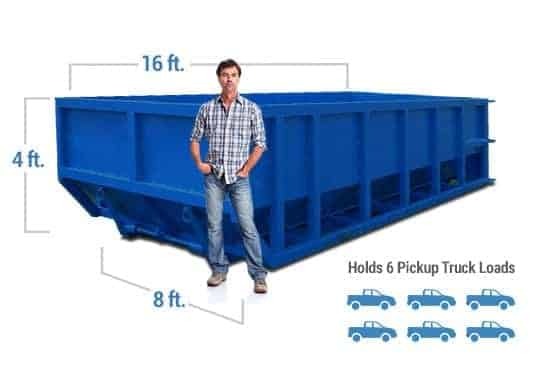 The container size you decide to reserve depends on the type of project and amount of debris that will be produced. To find the best available option give one of our team members a quick call. We will fit you with the best dumpster size so that you do not overpay. Each dumpster is designed to handle everything from home clean outs to remodeling projects. Roll off dumpsters are open top, medal waste containers that are utilized for household trash, yard waste, and construction debris. Depending on the location of where you need the container we suggest planning ahead so that you don’t need to waste energy by moving your waste twice. Discount Dumpster offers a large inventory of temporary dumpster sizes for disposing of waste at one time projects or multiple day projects. Though it is not always necessary a City of Kissimmee Right Of Way/Easement Utilization Permit may be necessary. When placing a roll off dumpster on a public street or sidewalk a permit may be required. Though do not worry about it because we will handle the heavy lifting for you. When you rent with Discount Dumpster you will be getting high quality service and no hassles to be had. We fill the permit out for you and only charge back what the city charges us, that simple! What is prohibited from putting in a dumpster?